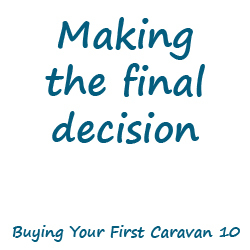 I thought it would be a great idea to kick the How 2 Caravan blog off to a flying start with a 10 part series on “Buying Your First Caravan“. I will make a new post each day until the end of the series. Subscribe to our email list using the box to the right and I’ll remind you when a new post goes live. So here we are at the beginning of my first blog post series! Buying your first caravan can be an extremely daunting experience if you are not equipped with the right knowledge, and that’s where I come in. I am going to walk you through the things you need to consider before you buy your first caravan. Without further ado, let’s jump right into the first post where I will be discussing what you want from a caravan. I really hope you enjoy the first post and would love to know what you think so please feel free to leave me a comment below. Just one more thing: You might want to grab a pen and paper as we will be writing a few notes during this post. 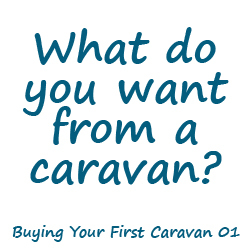 What do you want from your first caravan? Where do you intend to go with your caravan? Will you travel in the UK, will you venture overseas? Who will be travelling with you? Will you go alone, with your partner, children, grandchildren? How long will you travel for? Will you be taking short weekend trips or longer week, 2 week trips (or more)? Grab your pen and paper and begin writing the answers to the questions above as best you can. Right now it is not crucial that you are able to give 100% full answers as plans and circumstances can, and will change. You can revisit these questions at any time. Remember that there are no right or wrong answers because this is all about what suits you and your family the best. Your answer to question 1, where do you intend to go with your caravan, will help you to decide a few things later on. For example; if you are going to be travelling into Europe would you cope in a small caravan for two weeks with no air conditioning? I know I wouldn’t! Generally speaking, there will be some caravans that are better suited to travelling abroad and some that are not. This is due to the specification of the caravans and some key features that you may need when travelling further afield. Your answer to question 2, who will be travelling with you, will simply indicate what size and berth of caravan you should look for. Or, if you should chose to buy an awning to cater for any guests. And finally your answer to question 3, how long will you travel for, again helps you to think practicality. 2 weeks in a small 12 foot caravan? Something a little bigger might suit better. The answer will also help you to decide what accessories / extras you should buy which we will be discussing in greater detail at a later part in this series. If you haven’t already made a note of your answers it would be a good idea because we will be using them in future posts in this series. So where are we so far? You should now have a better idea of what it is you want from your caravan, it will have a lot of influence on what caravan you end up buying. 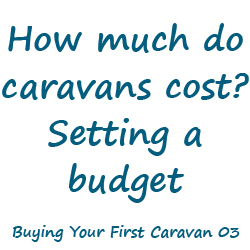 I really hope you have found some value in the first post in this series of “Buying Your First Caravan”, why not share your answers with the How 2 Caravan community in comments section below? Stay tuned as tomorrow we will be discussing vehicle towing limits and looking at driving license requirements to tow a caravan, have you got the correct entitlements on your license?